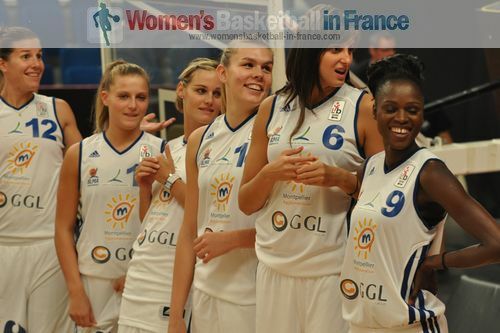 Three teams from France have qualified for the EuroCup Women quarter-finals. Tarbes missed out despite having home court advantage. In the quarter-final pairings the big clash is a repeat of the 2012 ECW final between Kayseri Kaskispor and Dynamo Kursk. Tarbes came into this game against Dynamo Moscow with a 1-point lead and within 15 minutes had an aggregate score advantage of 11 points. However by the time the teams went into the locker room Dynamo Moscow had outscored Tarbes 22-7 to lead the game (42-37) and the series by 4 points. Tarbes managed to level the match (59-59) briefly with three minutes to play in the third quarter. Yet this was as close as they got to stop their Russian visitors. Dynamo Moscow won (88-80) with Crystal Langhorne scoring 26 points and pulling down 10 rebounds and Irina Sokolovskay's three-point shooting (5-of-8) in her 21-point total. For Tarbes Paoline Salagnac regained her scoring touch with 22 points but it was not enough as her team bowed out (135-142). Lattes Montpellier were in trouble at half time trailing (28-38) to Adana Botas and seemed on their way out of the EuroCup Women. However they fought back in the second half with the energy and scoring by Géraldine Robert (16 points), crisp passing by Virginie Brémont (8 assists) and a game winning three-pointer by Emilie Gomis. However nobody should forget the unselfish work of their captain Gaëlle Skrela who kept the team clued together. Christi Thomas and Courtney Paris (11 offensive rebounds) combined for 33 points for Botas while battering Montpellier on the offensive boards but in vain. Hainaut Basket secured their qualification. They took full advantage of the foul problems of Natallia Anufryienka by seeing off BC Horizont (62-52). The hero of the match was Laura Garcia who scored 28 points, dished out 3 assists while making 6 steals. Nantes-Rezé were the first team to qualify for the quarter-final despite a home defeat to Olimpia Grodno (62-67). In the all-Turkish clash between Mersin and Kayseri Kaskispor, it was the guests that came out on top to qualify. Asjha Jones and Lara Sanders scored 16 points each for the winners. BC Chevakata trailed by 18 points coming into game two but ended up crushing Antakya (73-46). They restricted Jolene Anderson to just 12 points who had been averaging 25 points coming into this game. Glory Johnson had a game high 21 points for the Russian team. MBK Ruzomberok was not sure of even having a team this season after losing a major sponsor. Yet they are preparing for the quarter-final match against Nantes-Rezé after eliminating Dynamo-GUVD (69-60). Ruzomberok lost the first match at home by 3 points. So their road victory can be considered as the upset of the Eighth-Finals.